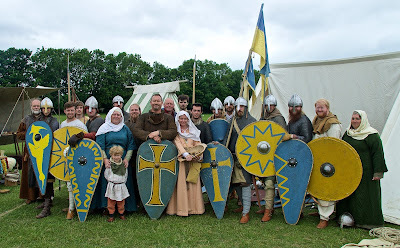 We are the Milites de Bec – reenactors of Norman, Viking and Anglo-Saxon life in tenth and eleventh century Britain as well as the lives of Normans and Anglo-Normans in the twelfth century and Crusaders in the thirteenth century. Our head quarters and training grounds are at the University of Kent in Canterbury. But we have members from all over Kent and from other parts of the county / country / world. We are part of Regia Anglorum, a nation-wide early medieval reenactment society, which you may have seen at living history events or on TV. We are also involved in Regia Anglorum’sWychurst project where we are building our own small holding.